When you put pen to paper without any specific purpose or meaning, what comes out of it? 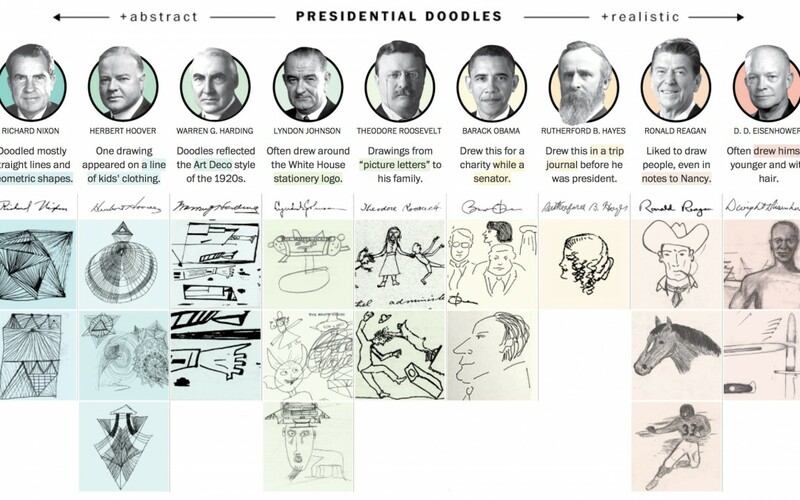 Apparently there is a huge fascination with the doodling practices of American presidents, trying to decipher things unknown by analyzing how and what they jotted down. 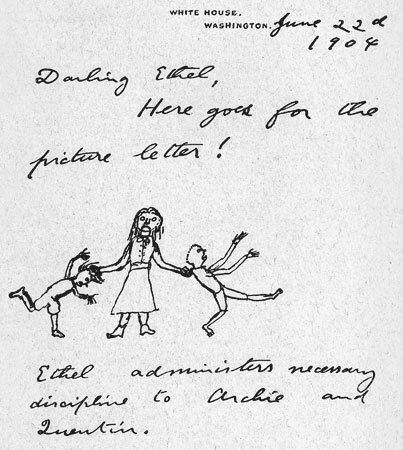 Washington Post had their cartoonists critique the various examples of presidential doodles; and there is even a book compiling 200 years worth of doodles from the Oval Office. I was surprised to see that one of the commenters on presidential doodles said Nixon’s geometrical lines looked scary. I would have thought that this style was among the most common ones, having myself made plenty of similar marks, especially while talking on the phone. 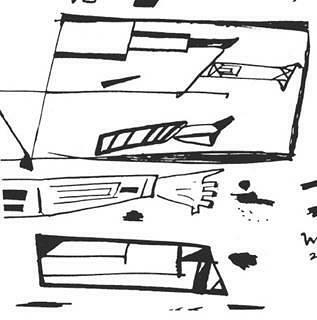 Harding’s doodle is very interesting because to me it shows acute awareness of his contemporary art movements. In just this one image there is a mixture of strong black lines of the art deco style, the geometrical forms of futurism and the dark humor of dadaism. I think it’s fascinating, he must have been either actively interested in art or very visually attentive. Roosevelt’s picture letters are a little creepy, nevertheless they definitely have the most depth in this bunch. They not only tell a story but also represent mood and movement, which to me shows that he had a good visual memory and some practice in drawing. 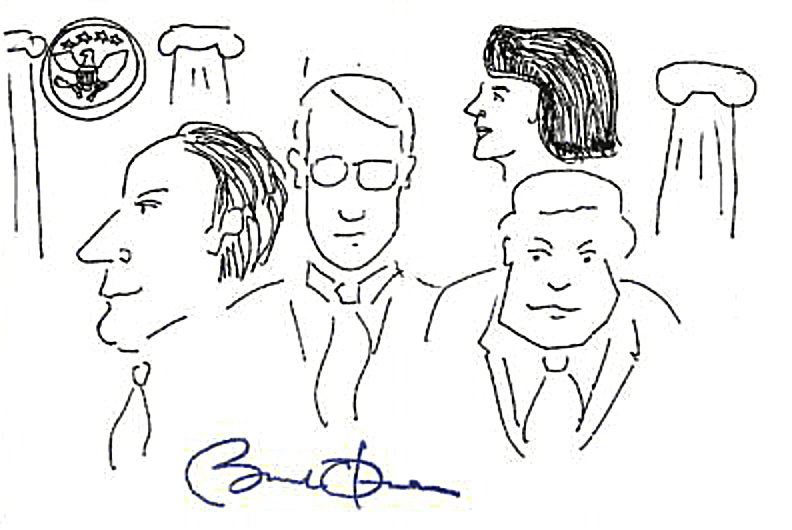 Obama’s doodle is the most fascinating of the bunch for me. Not because he drew recognizable caricatures of politicians and named them as pillars of the state without uttering a single word. Clearly, the man has some skills; even his signature is quite artistic. What interests me most is his drawing style: the short unconnected lines that make a whole. This is the exact opposite of the way I draw so I find it very intriguing and would like to see his line work in action. How about you, why do you doodle (or don’t) and what is your go-to style? Leave a comment below or share a picture.